Today, the Human Rights Campaign (HRC) Foundation, the educational arm of the nation’s largest lesbian, gay, bisexual, transgender and queer (LGBTQ) civil rights organization, released a compilation of heart-tugging videos from its year-long #LoveYourNeighbor campaign, which focuses on the stories of LGBTQ people in the South. 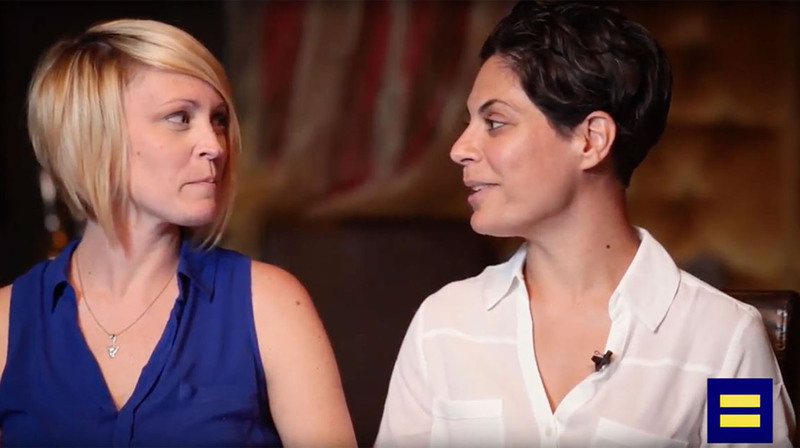 The videos feature stories about the experiences of LGBTQ couples living -- and loving -- in Alabama, Arkansas and Mississippi. The #LoveYourNeighbor campaign is a storytelling project focused on sharing the experiences of LGBTQ people and allies across the South, particularly in Alabama, Arkansas and Mississippi. HRC has permanent campaigns in these three states as part of its Project One America campaign. It is partially funded with a grant from Toyota, which has a manufacturing plant in Mississippi. For nearly a year, new videos have been released each month on social media and promoted by HRC both in-state and around the country. Jordan and JB, a gay couple in Huntsville, Alabama. Amber and Melissa, a lesbian couple who live in Little Rock, Arkansas. Rae and Zach, two transgender people in a relationship in Little Rock, Arkansas. Jon and David, a gay couple in Tupelo, Mississippi. Toula and Ashley, a lesbian couple in Fayetteville, Arkansas.